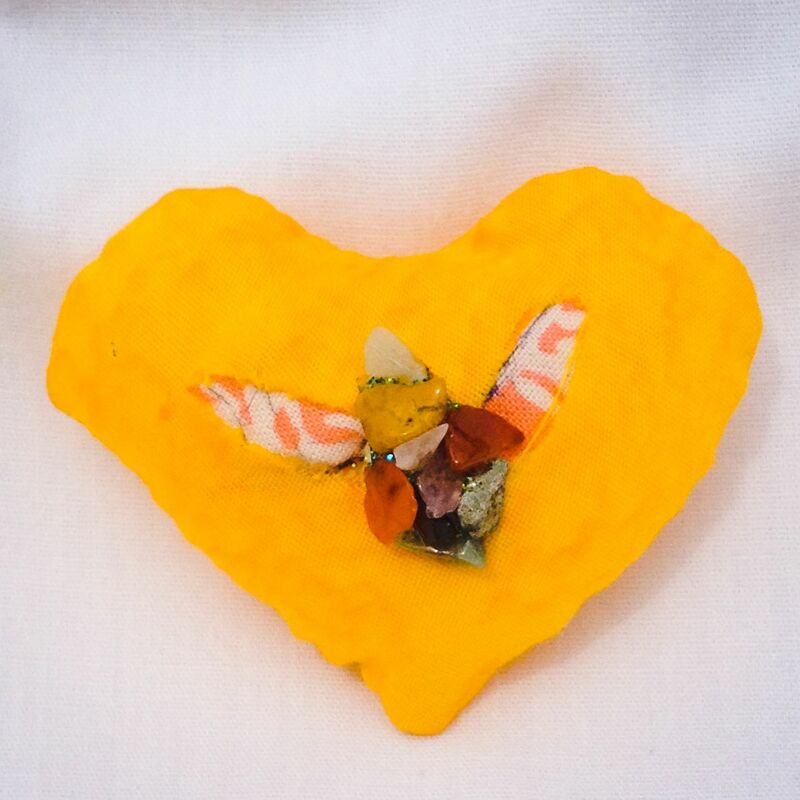 Thank you for visiting Zen Hens Art! 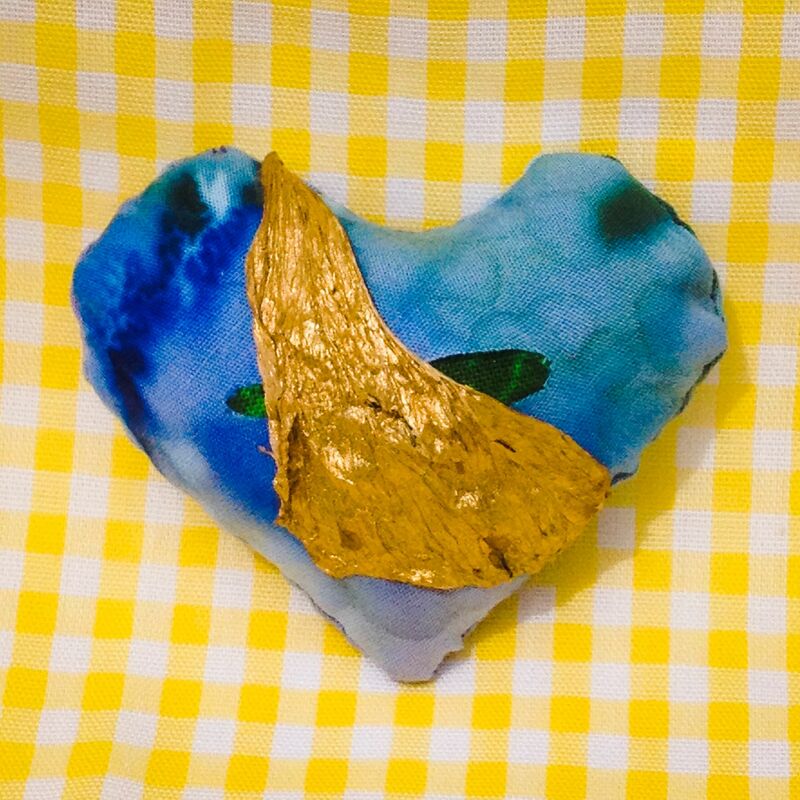 My new brand, Alexis Art Studio, has a new blog and new etsy shop. Follow Alexis Art Studio on Facebook, too. 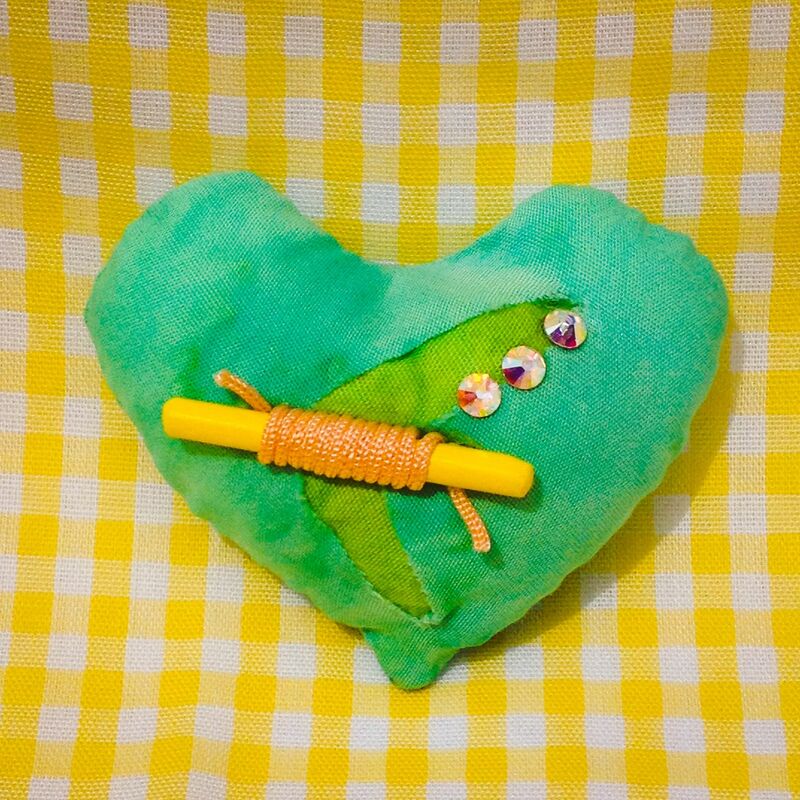 While you’re here, feel free to browse around and let me know if I can help you find a handmade item you love. Three reuseable baggies and a keeper. How a baggie looks with 1.5 lbs lentils. Saves on plastic when you shop! How cool is that? 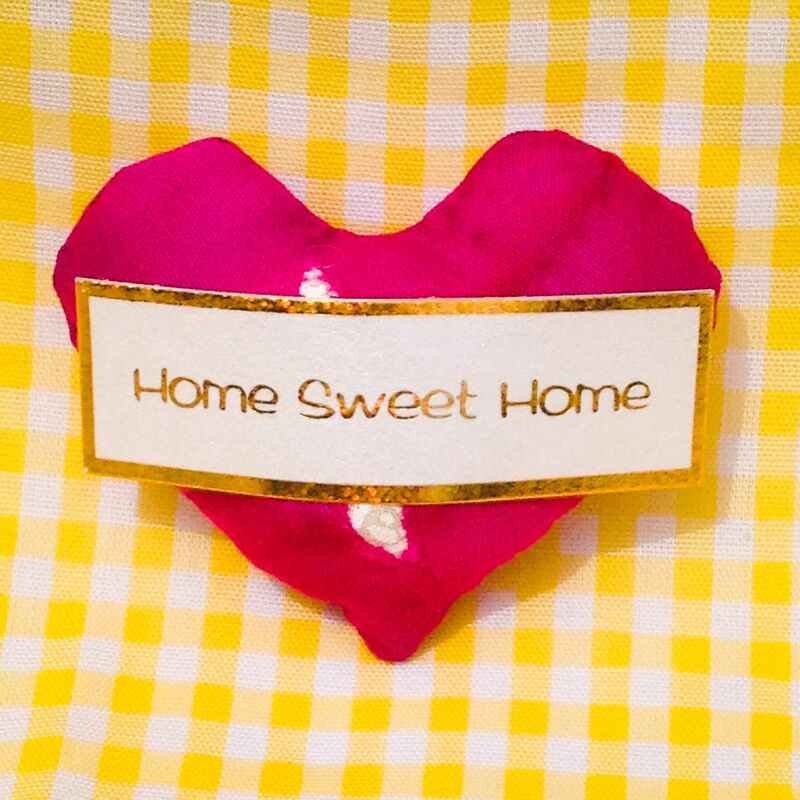 A fun and inexpensive item to use or give with pride. I’m so excited to finally be presenting this product in the new and improved version that I have dreamed of. I feel good about offering an alternative to plastic bag use. And I like the way the product makes its own packaging, with just the addition of a small explanatory tag. 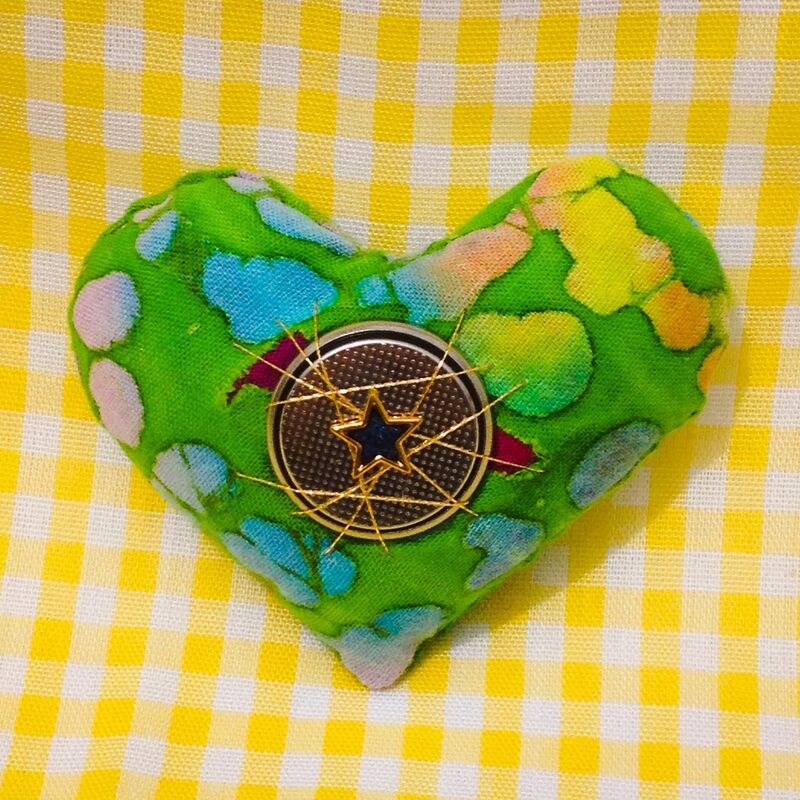 My new serger turned out to be a wonderful tool. It allowed me to make more bags, faster and better, and have more fun doing it, too. Bliss. Each set consists of three baggies and a neat Hawaiian print keeper pouch with velcro closure. Suitable for almost any item that you regularly purchase in the bulk food aisle. 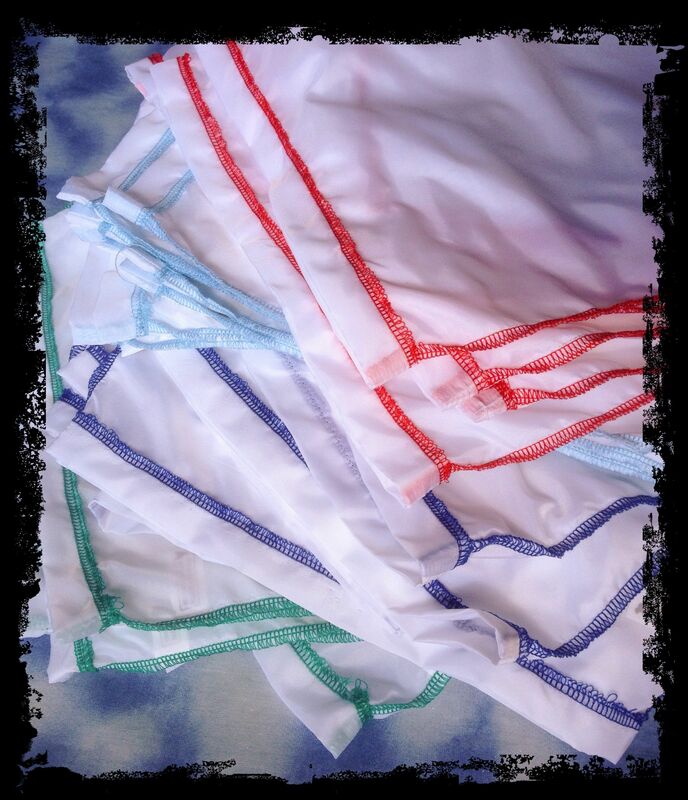 Baggies are made of untreated nylon, approximately 11×14 inches. They hold up to four pounds of food and their feather weight won’t add to your grocery bill. I have finished them with seams to the outside for easier cleaning. You can close the baggies with the twist-ties that are provided in-store for bulk bin numbers. The little pouch helps keep you organized and makes them easy to grab and go. A stack of around 58 bags. Some super hip and groovy friends of mine have tested the baggies and given me great feedback on how easy they are to use and clean. Simply shake out to clean, or give a quick rinse if necessary. Not intended as food storage, you’ll want to transfer your goodies to airtight containers when you get home. Next up, I also have plans to develop a net bag with a drawstring, suitable for apples, oranges and other items from the produce department. I hope the two styles together can help save a lot of plastic! Below is a slideshow of a few of the colors available. Please visit Alexis Art Studio etsy shop to purchase. Wholesale inquires are welcome on this product. 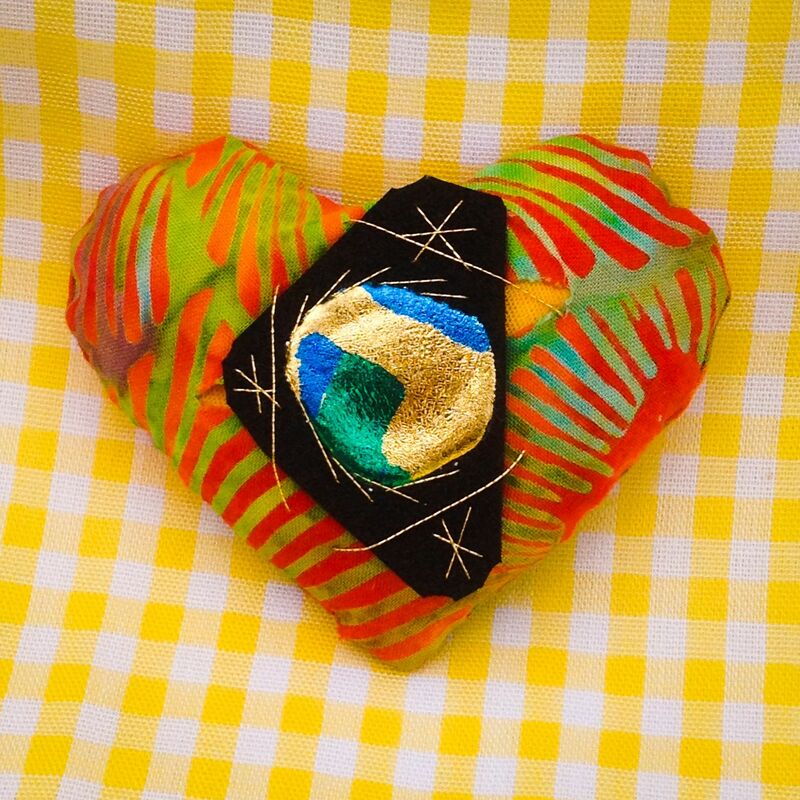 Aloha and Mahalo for your interest in my reusable baggies! The physical shop is currently closed for the winter. Zen Hens Art can always be found in our etsy shop and several locations around the Big Island, including Kona Stories Bookstore at Keauhou Shopping Center and Ocean View’s own Kahuku Gift and Garden. Meanwhile, I will be posting and sharing new products that I am excited about. Click on the follow button to get updates in your email. 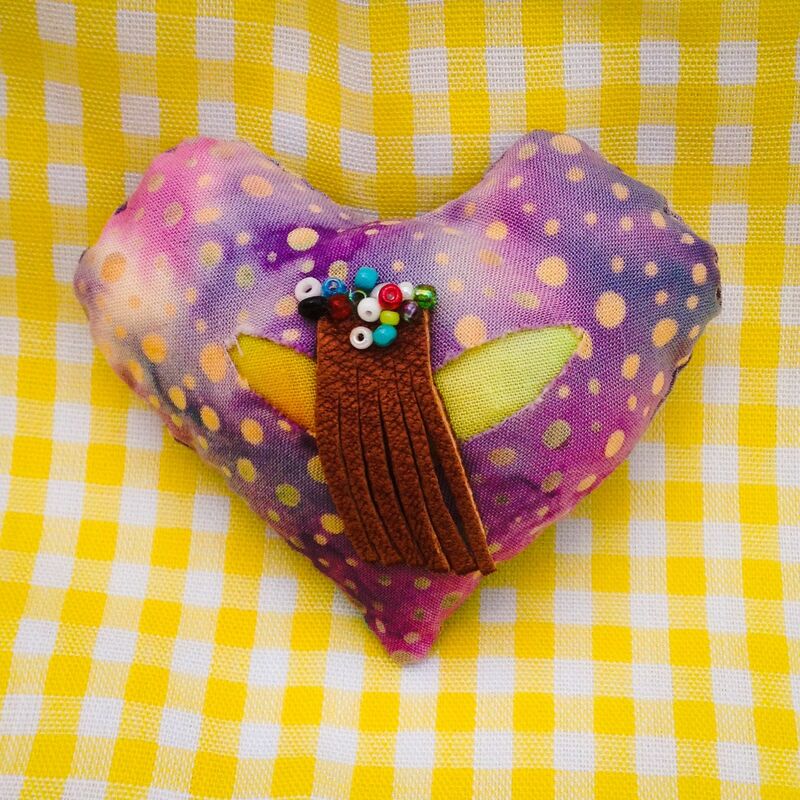 Also follow Zen Hens and our sister page for Mended Hearts on facebook. So now is a good time to regroup. 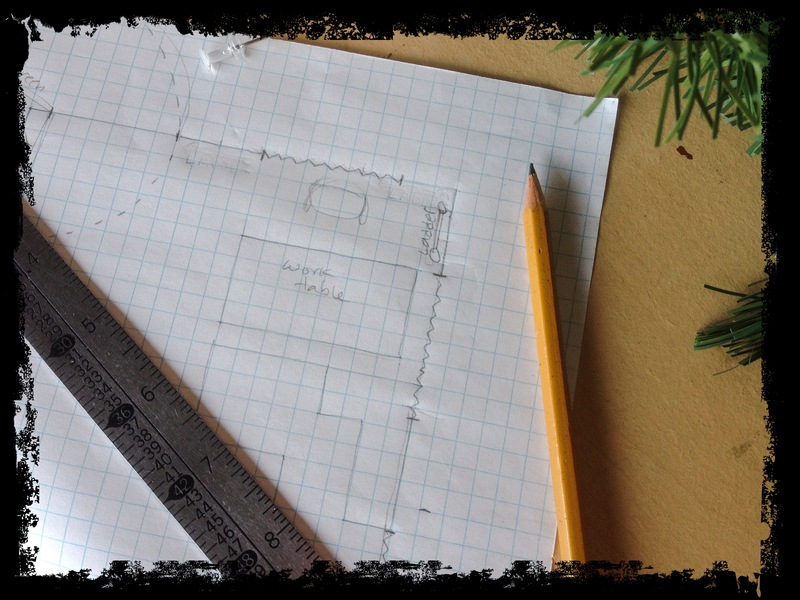 Plan and dream. My goal is to reopen the shop by May. We are talking about some wonderful upgrades. Most likely the work will be started but not finished so we will be working around some construction dust. Happy dust. I cannot say what the final design will be. What I can say is that I am very excited about all of the possibilities that we have under discussion!! We know that it will include a work table as well as a tiny selling floor. And, if we can work out the details, a cozy little loft for quick naps. That’s love. The Zen Hens are busy year ’round and we check our emails, too! Your inquiries and comments are welcome. Aloha and Mahalo from the Zen Hens to YOU! 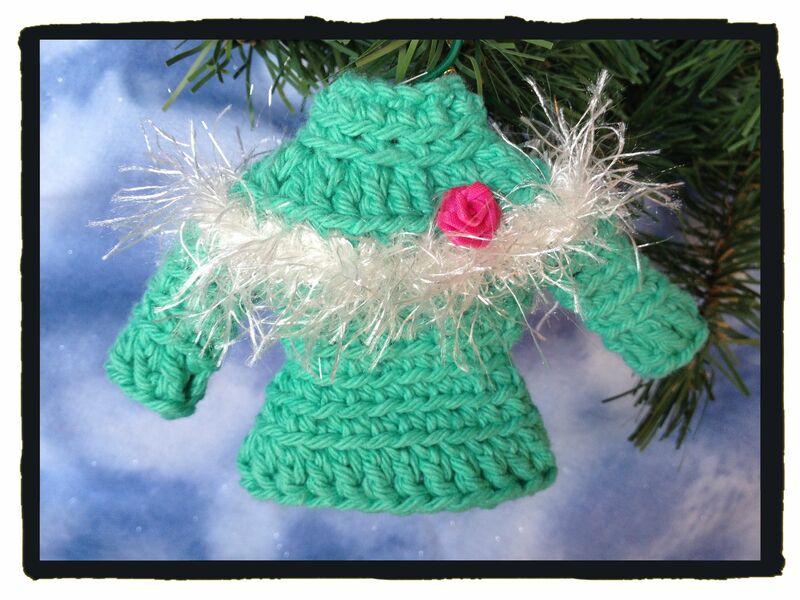 Warm your heart and your holiday tree with these 3″ tall crochet sweaters. Cotton yarn. Flexible wire hanger. 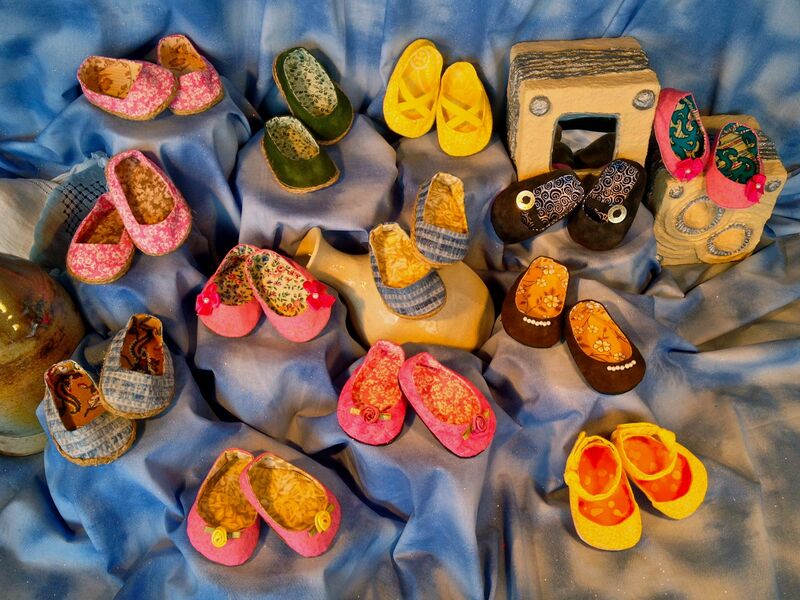 Assorted colors and fashionable styles. Shown below is the current collection. Since last year I have sold quite a few and made some new ones. Also, I’ve added some new embellishments like bows and rosettes. Some even have “Hawaii” or “Aloha” stickers on the fronts. 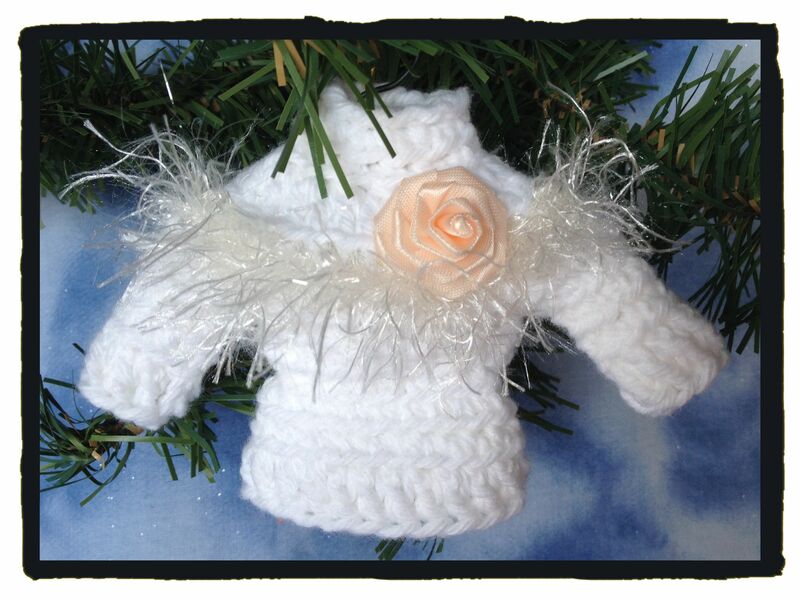 Please enjoy the show and visit our etsy store to purchase. 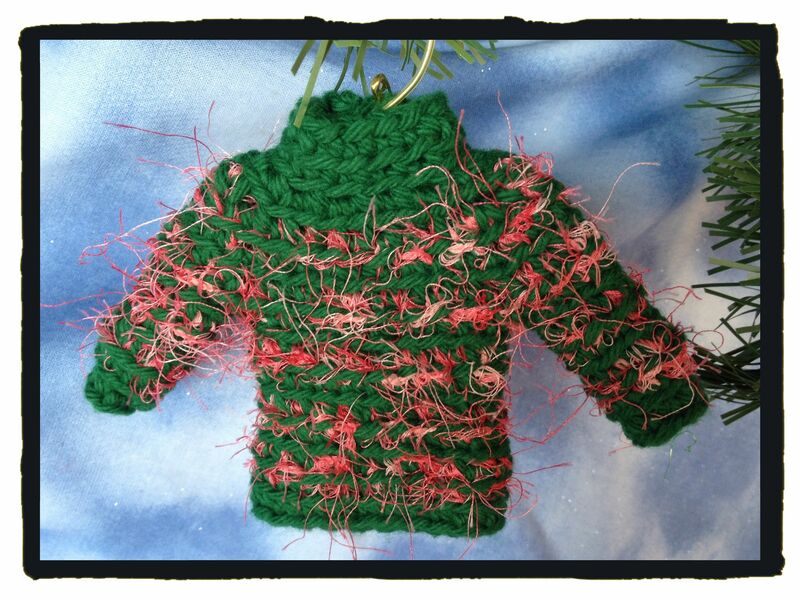 For you crafty types, check out the Project Instructions for my simple how-to instructions for making your own. 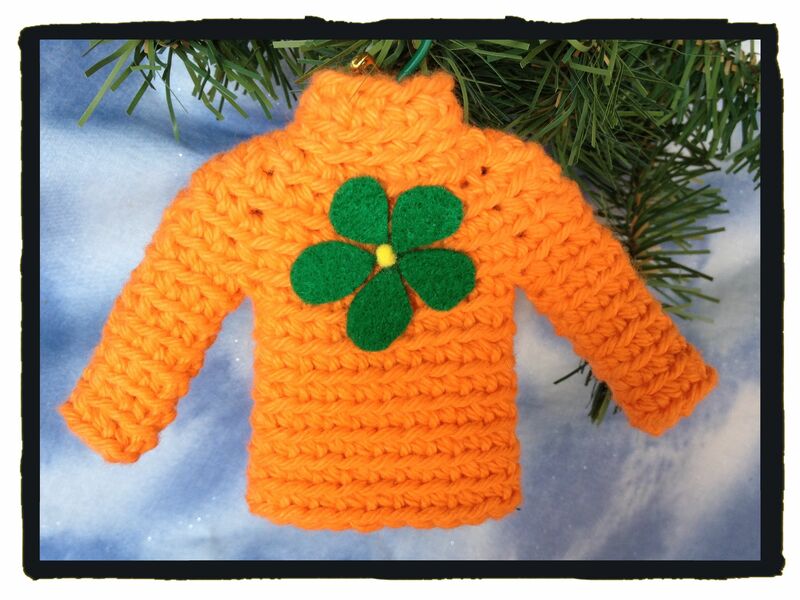 Orange sweater with green felt flower including a yellow pom pom in the middle. 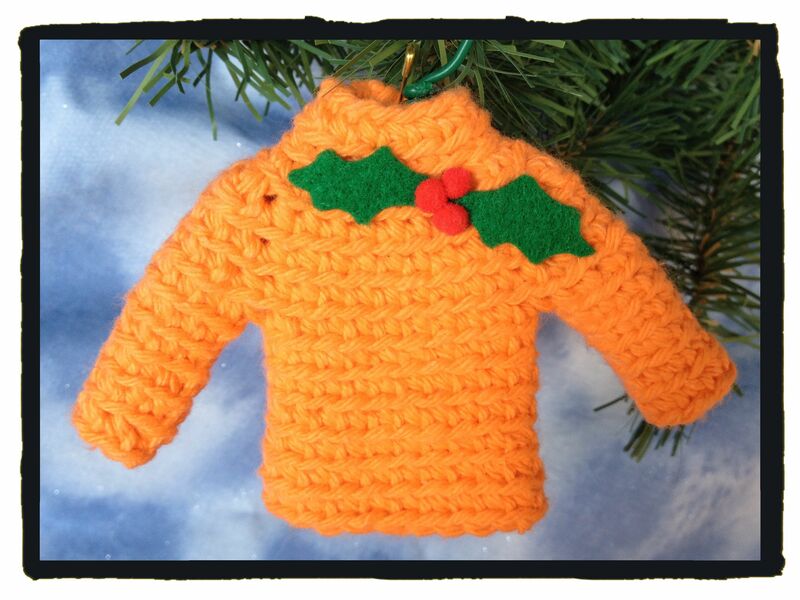 Orange sweater with holly berry motif of felt and pom poms. 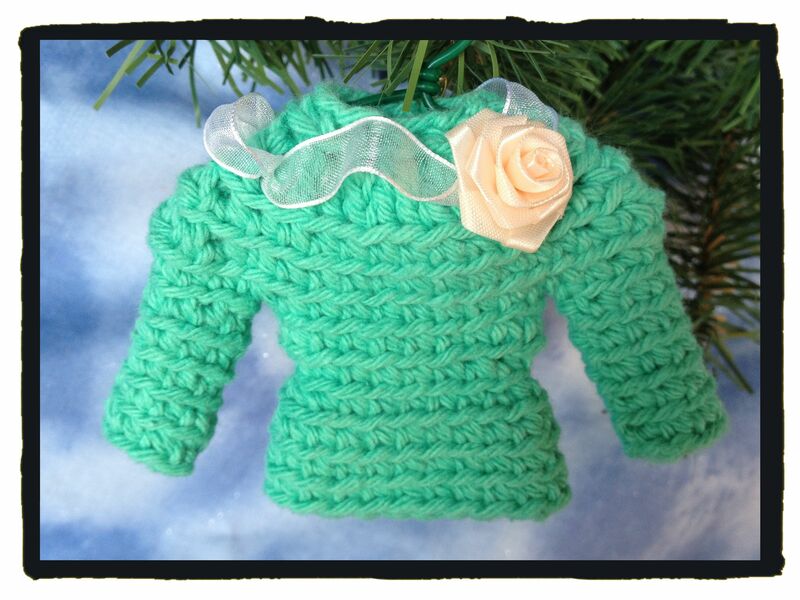 Light teal sweater with puffy sleeves and ribbon and rosette trim. 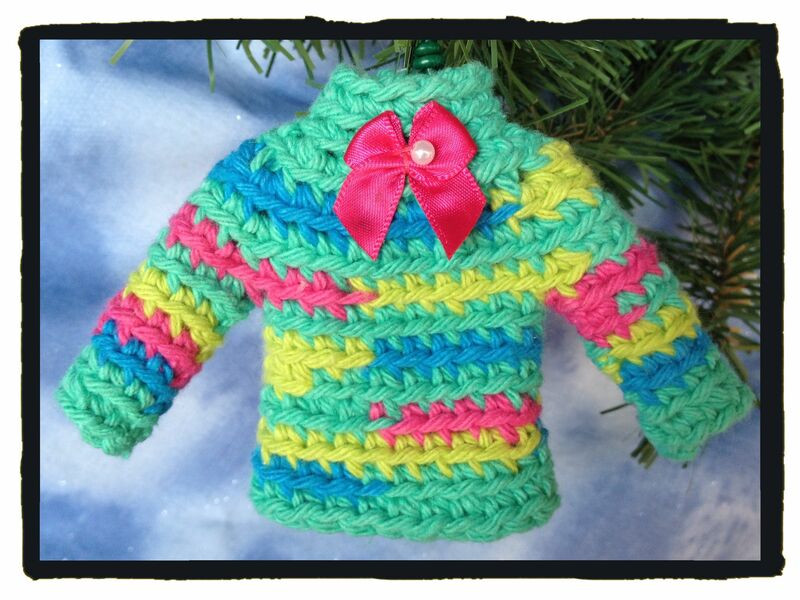 Multi-stripe sweater with pink satin and pearl bow. Hot pink sweater with pearly plastic snowflakes and Hawaii sticker. Hot pink sweater with white petal flower that has a tiny bead in the center, trimmed with white “fur” at the bottom hem. 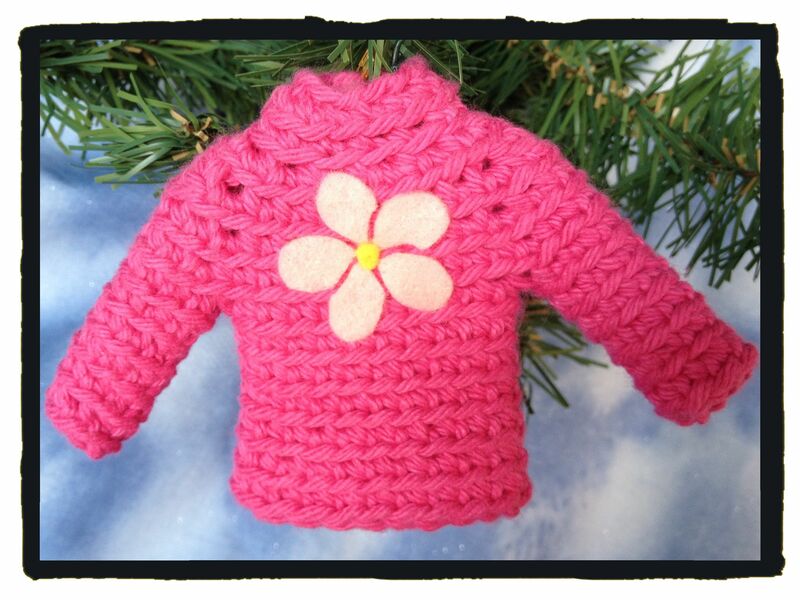 Hot pink sweater with pale pink felt flower including a yellow pom pom in the middle. 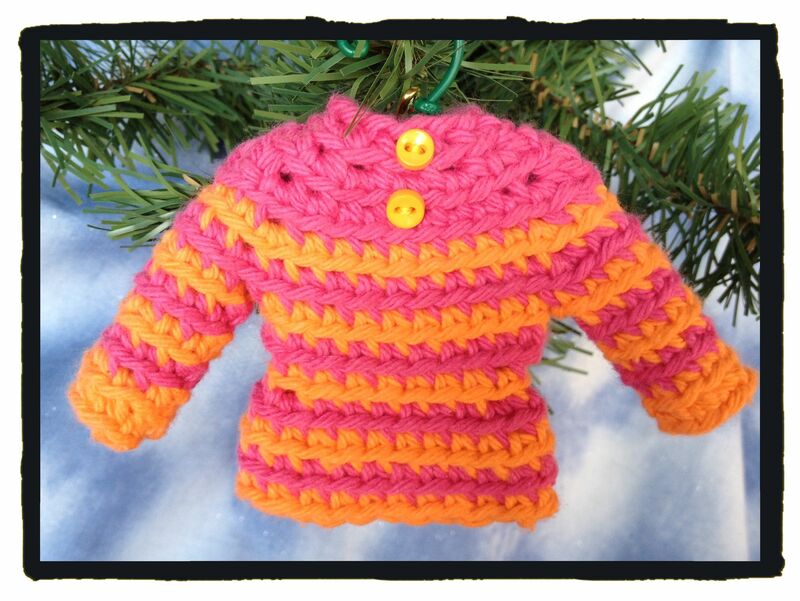 Hot pink sweater with tan yoke, accented with white feather yarn and pink satin and pearl bow. Orange and pink stripes! 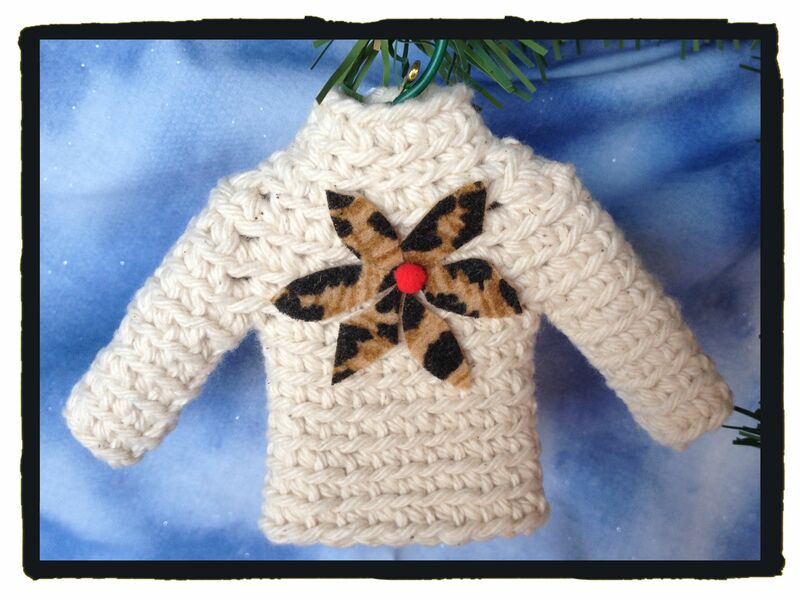 Accented with two adorable tiny buttons on the yoke. 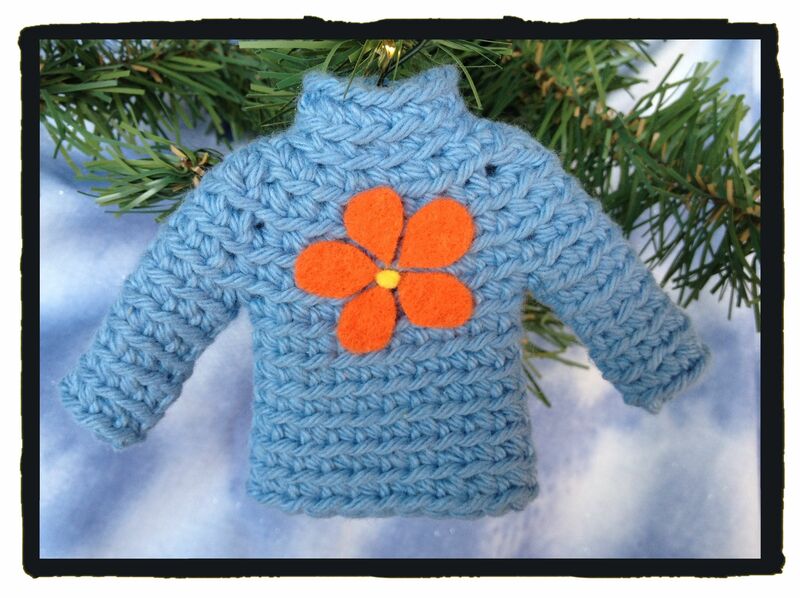 Light blue sweater with orange felt flower including a yellow pom pom in the middle. 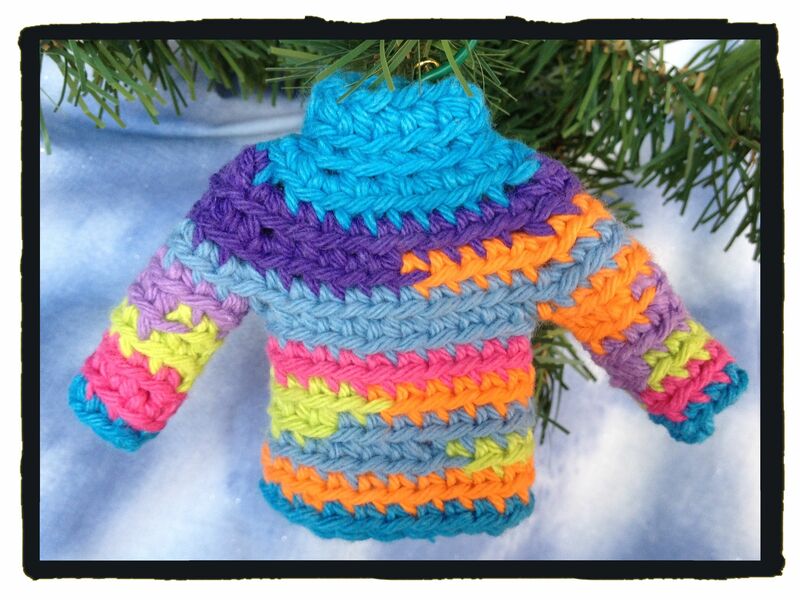 Blue and purple multi-stripe sweater. Classy tan with black and white. Feather yarn, red rosette. 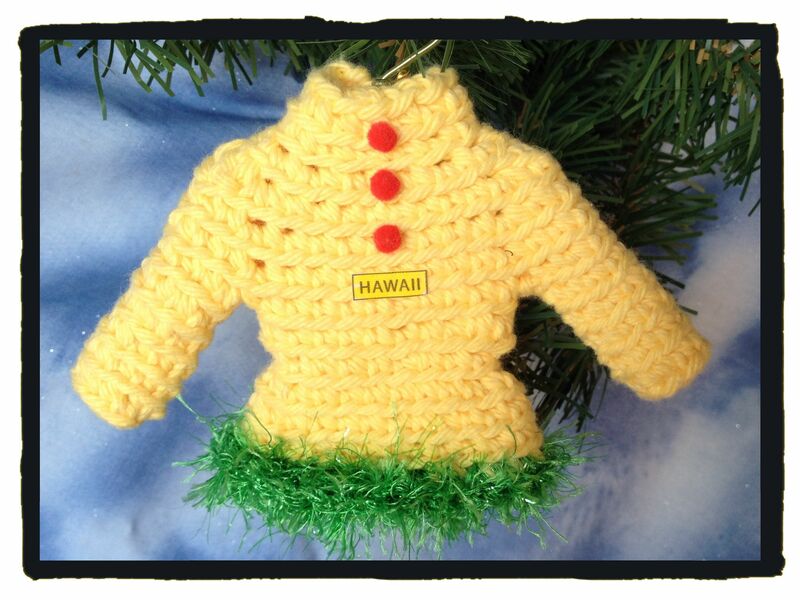 Yellow sweater with red pom pom buttons, Hawaii stickter and green “fur” trim. 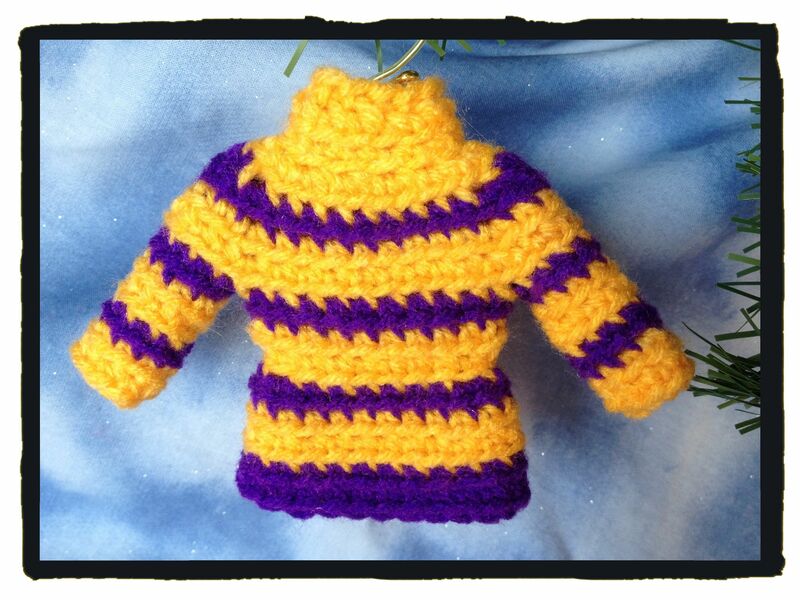 Team spirit gold and purple stripes. 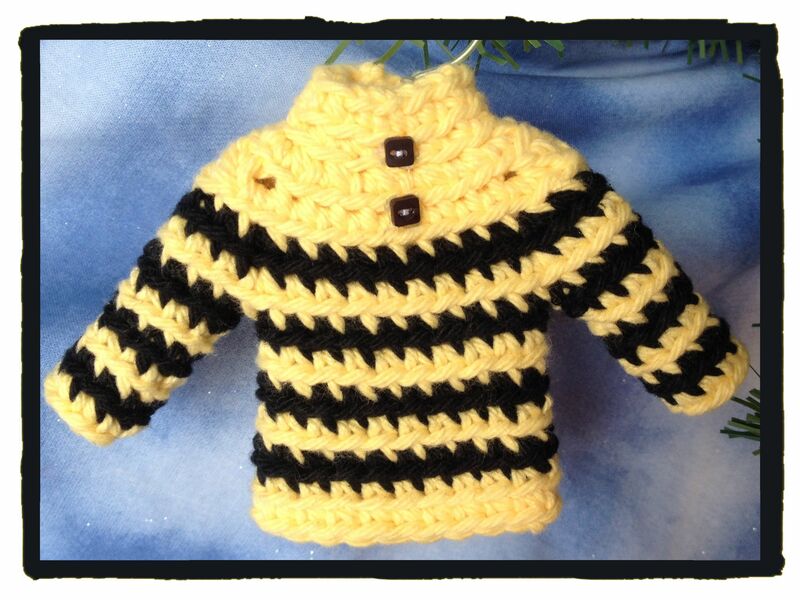 Yellow and black bumble bee stripes accented with itty bitty square buttons. 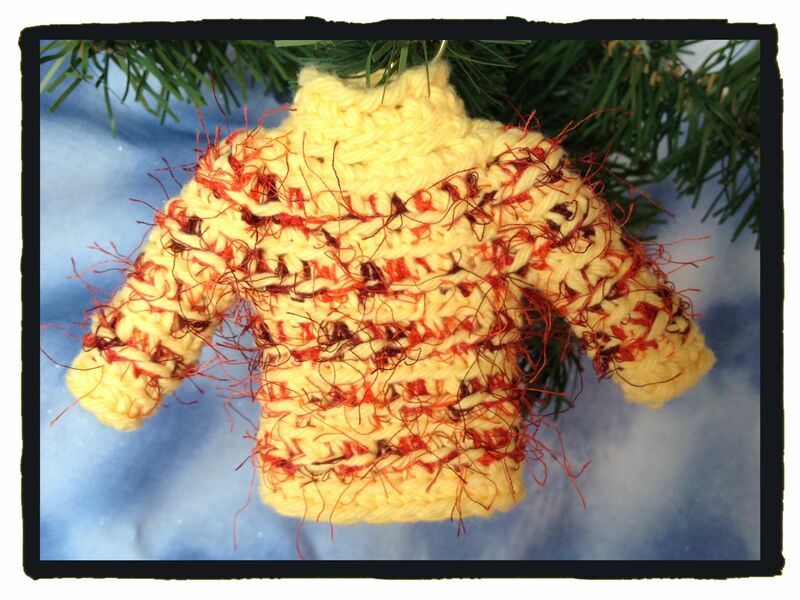 Yellow sweater accented with red-orange-rust feather yarn. 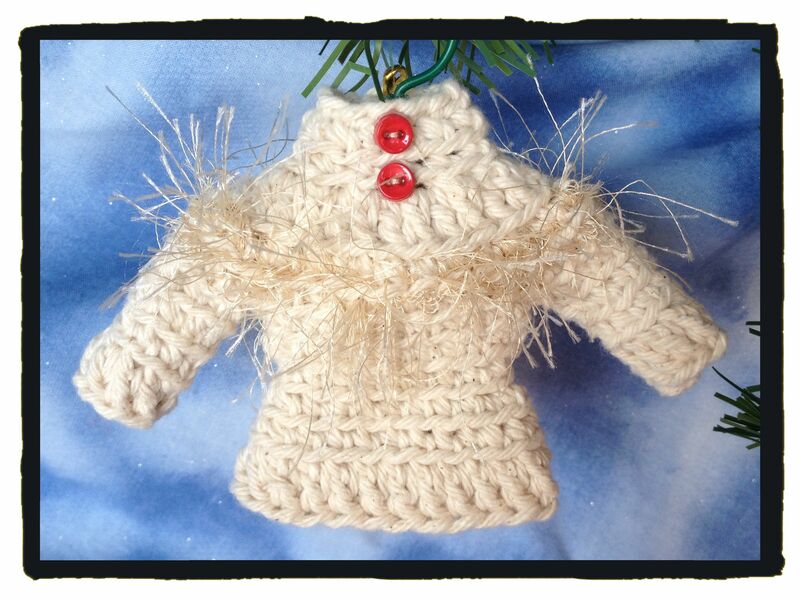 Natural tan sweater accented with feather yarn and two tiny red buttons. 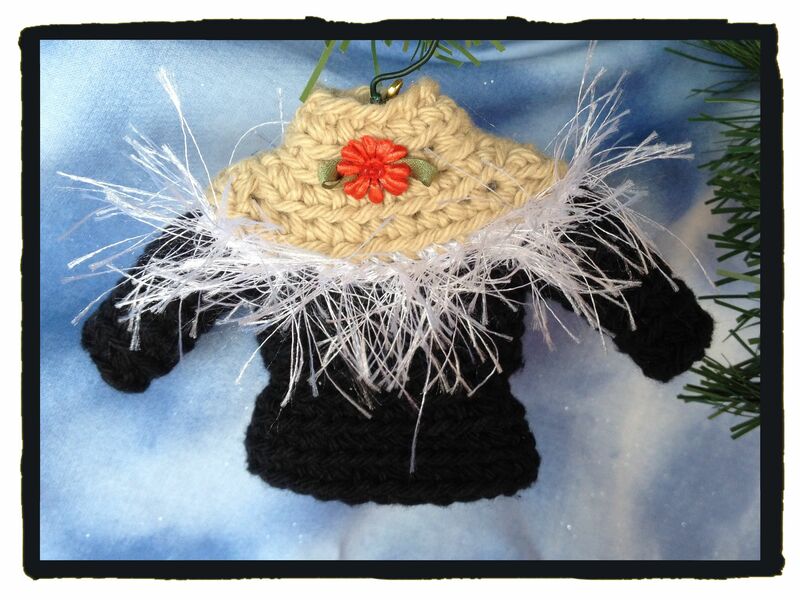 Natural tan sweater with brown feather yarn accents and embellished with a single brown button. 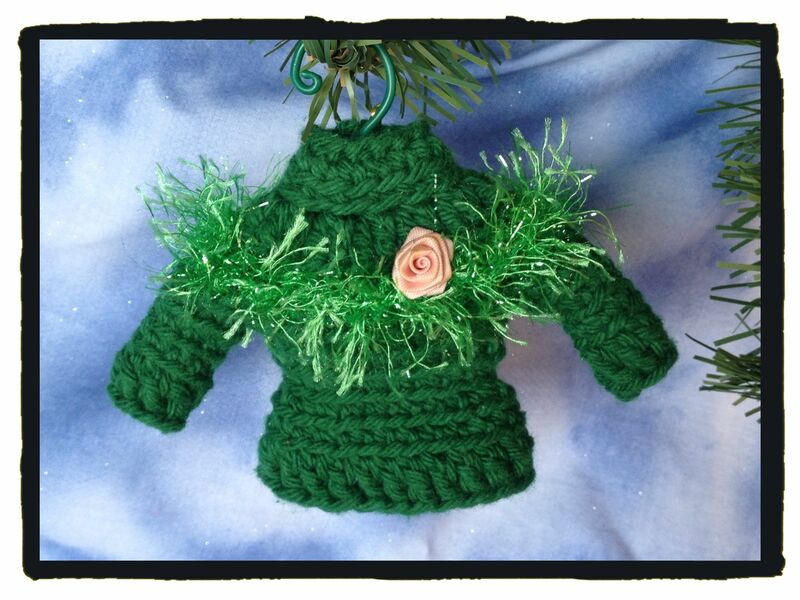 Green sweater with pink varigated feather yarn. 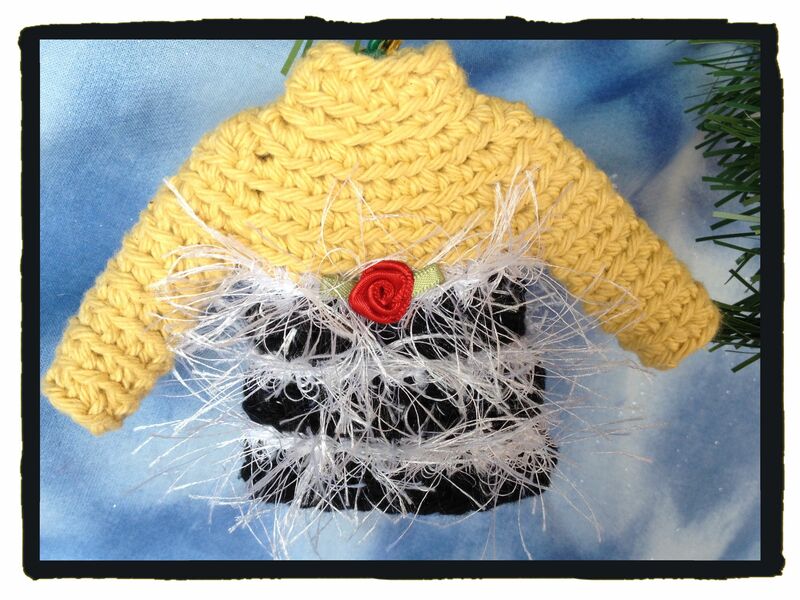 Black sweater with tan yoke, white feather yarn, and red petal flower with a tiny bead in the middle. 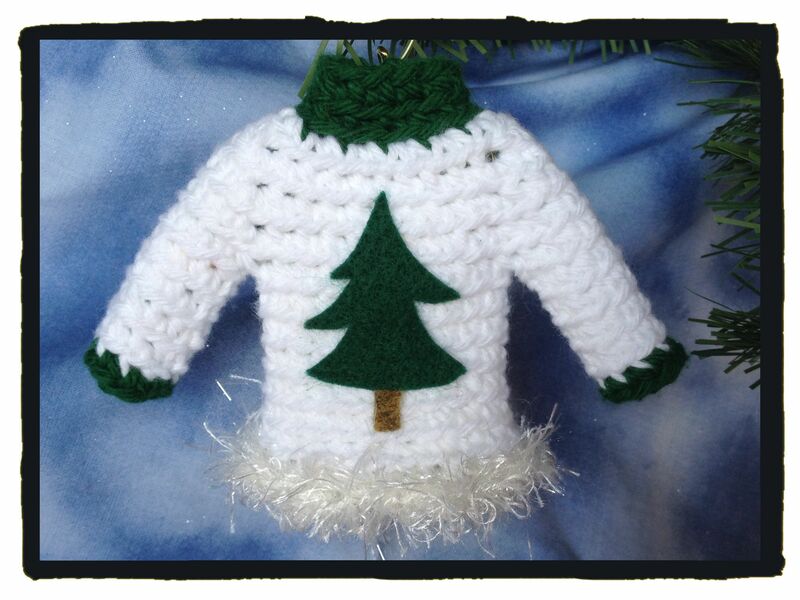 White sweater with Christmas tree and green trim. Accented with white “fur” at the bottom. 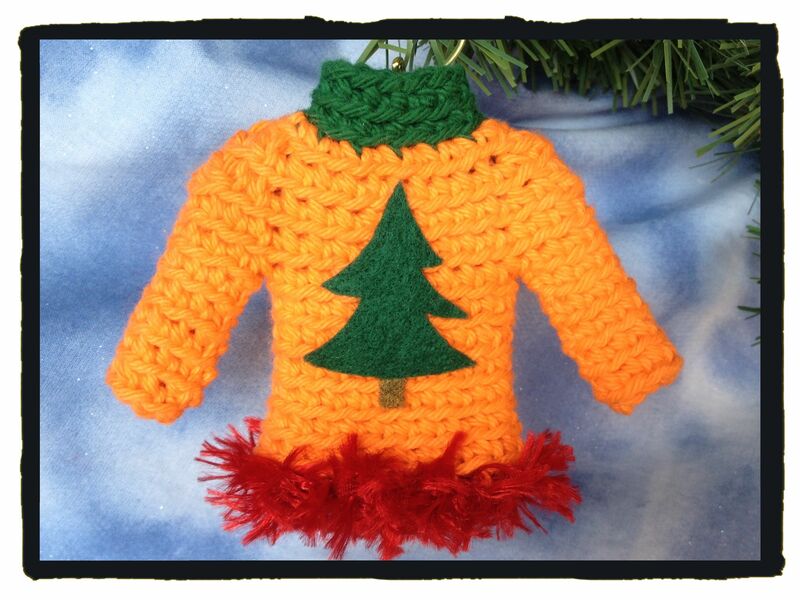 Tan sweater with feather yarn and white yoke. Red petal flower with tiny bead in the middle and a “Big Island” sticker. 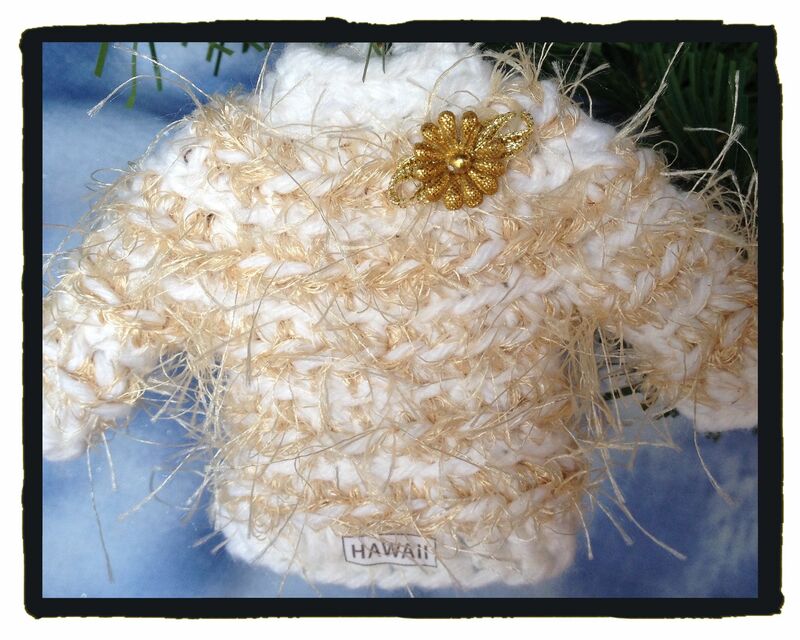 White sweater with tan feather yarn and “Hawaii” sticker. Embellished with a gold petal flower. 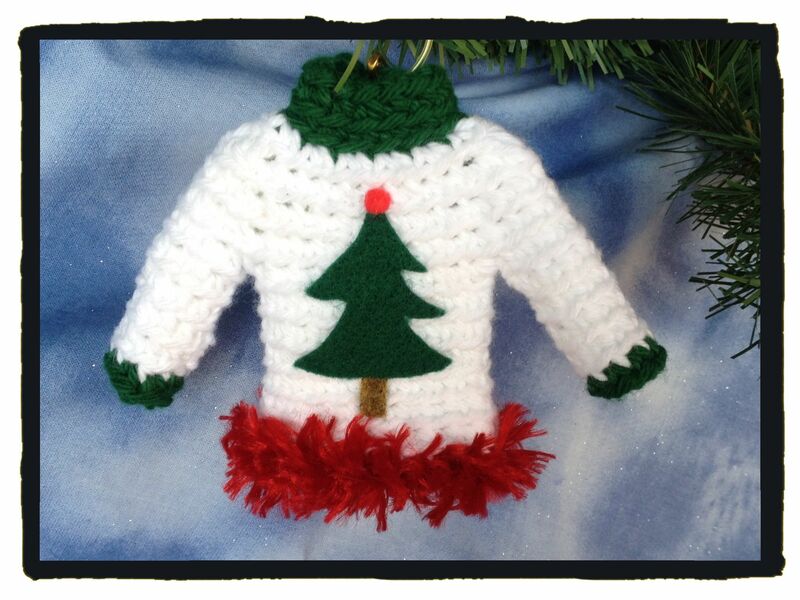 White sweater with Christmas tree topped with red pom pom. Green trim at neck and cuffs with red “fur” at the bottom hem. 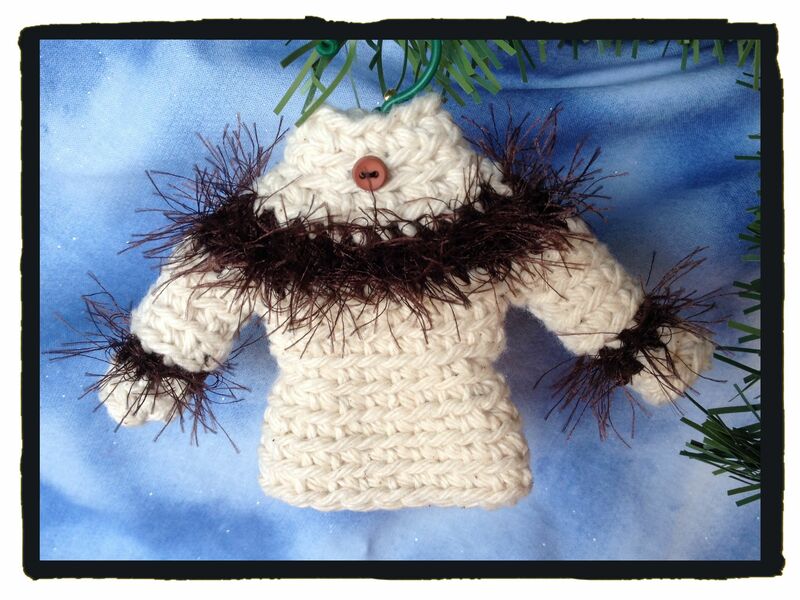 I am also offering this item as a special order. Contact me with questions and special requests. 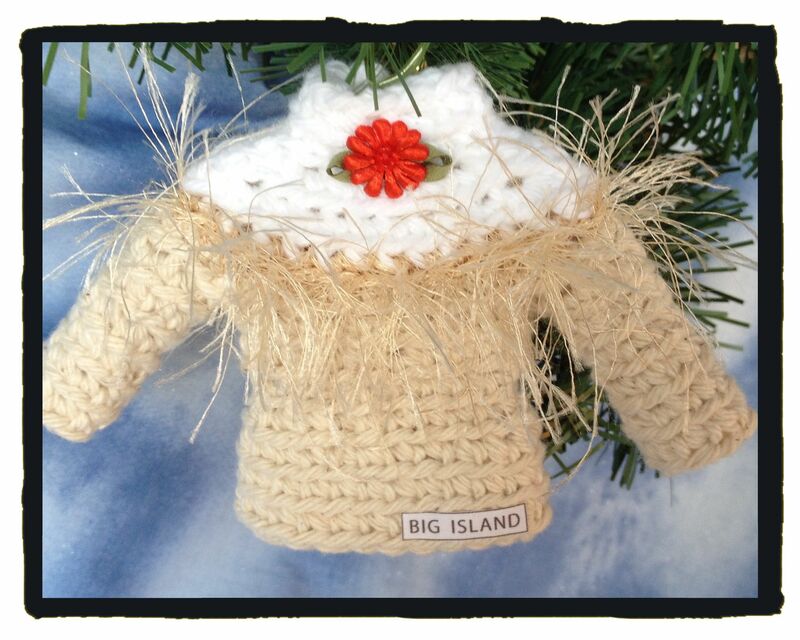 Thank you for your interest in my Aloha Sweaters! 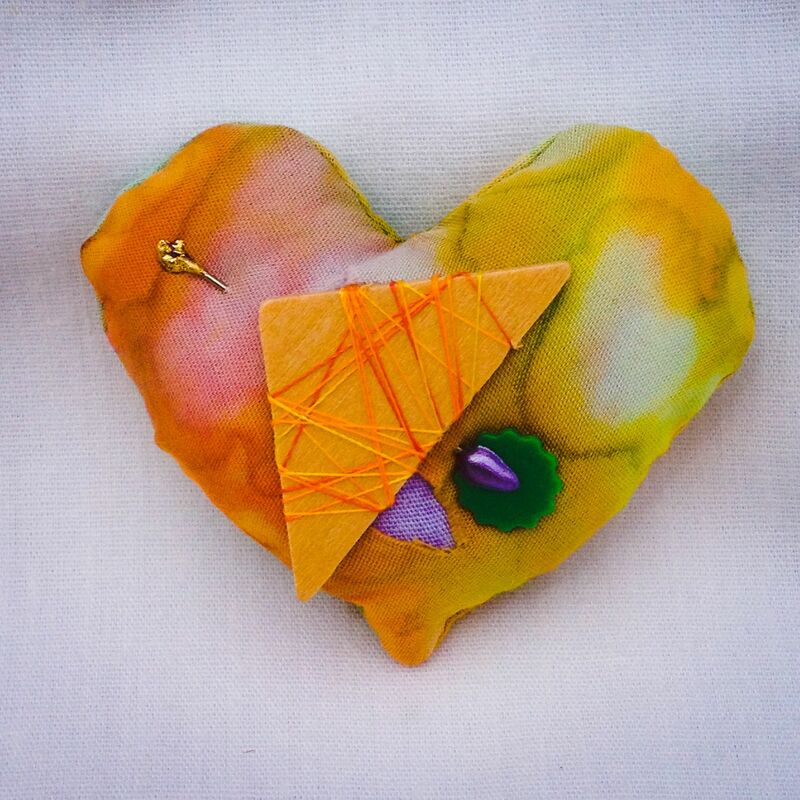 Mended Hearts are so many things and here are just a few of our small magnets. I hope this sampling gives your heart a lift. 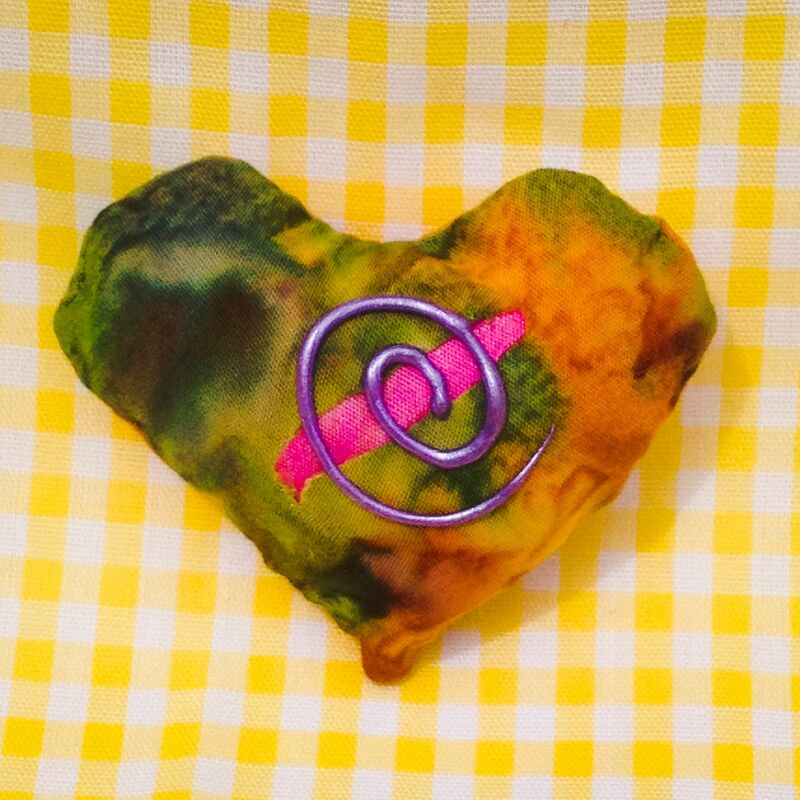 Mended Hearts go in spirals. Mended Hearts are earthy and rocky. 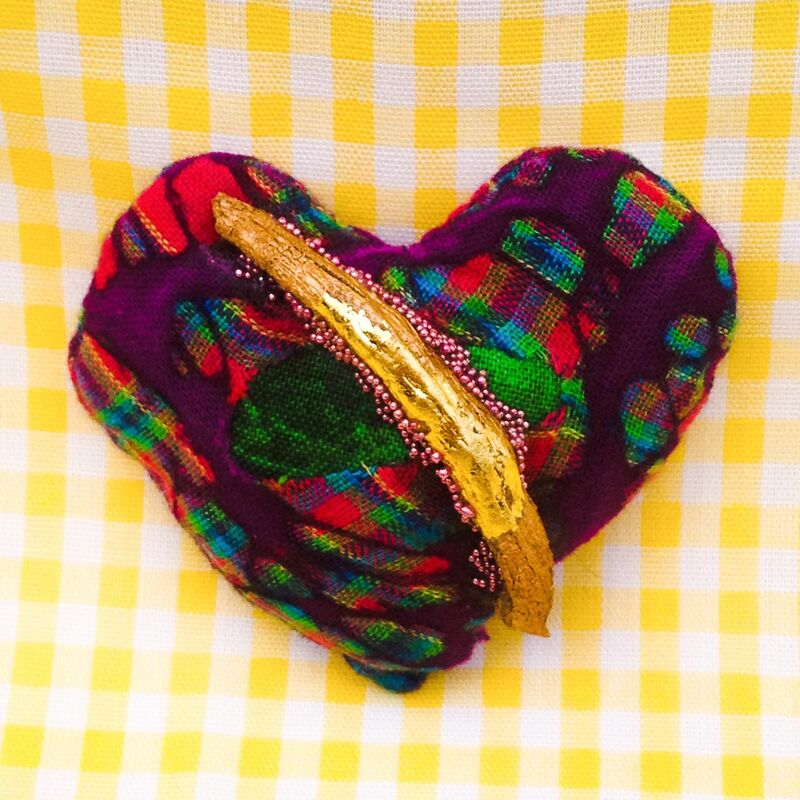 Mended Hearts are wild and sparkly. Mended Hearts are as fragile as a flower petal painted gold. Mended Hearts are for star crossed lovers. Mended Hearts are bound snugly. 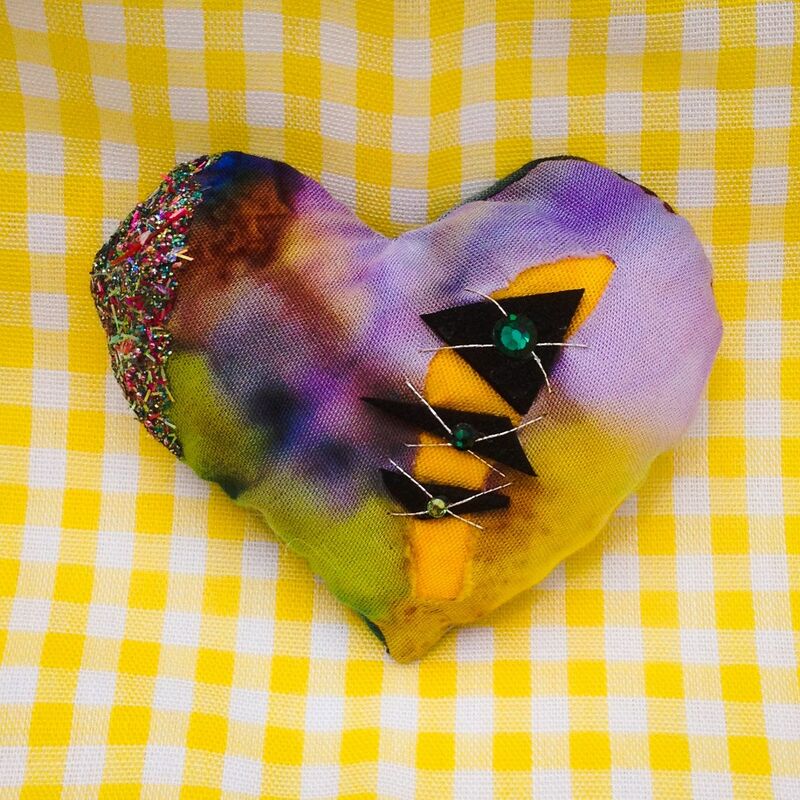 Mended Hearts are plaid with driftwood. 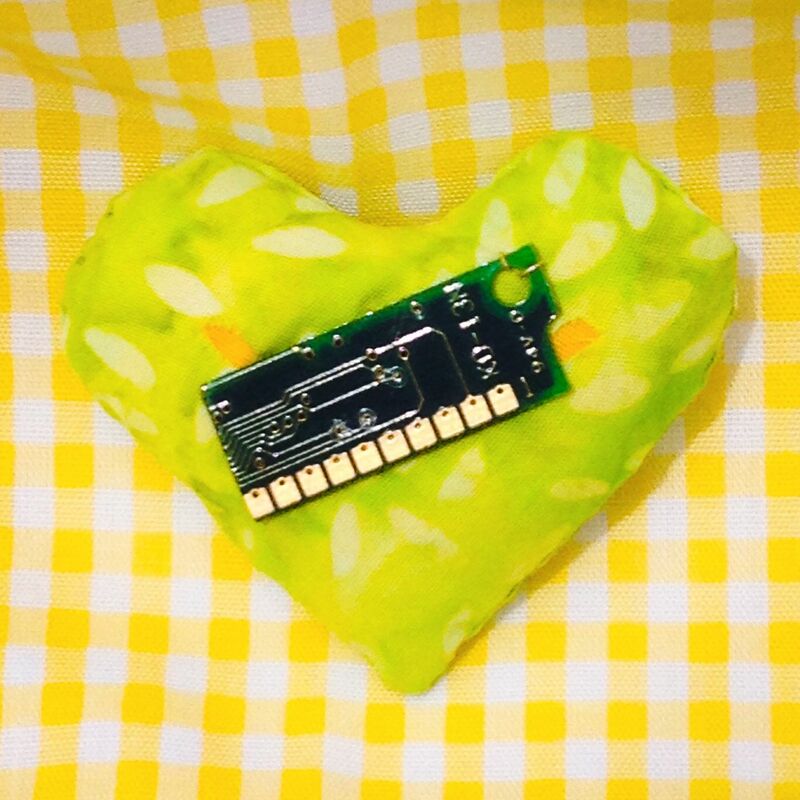 Mended Hearts have fancy pins. Mended Hearts are blue and heavy with stones. 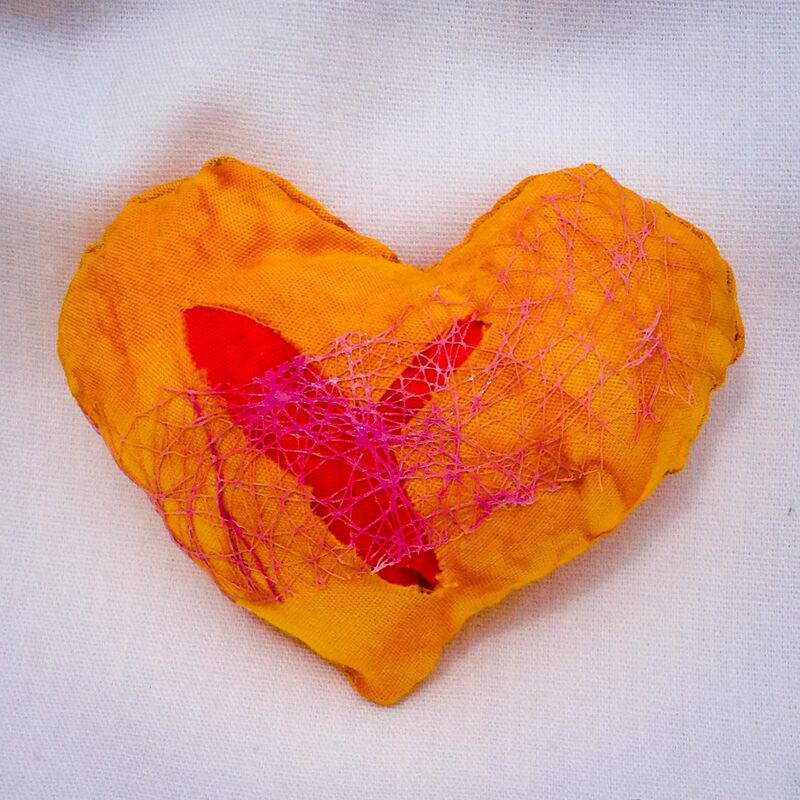 Mended Hearts are simple and bold. 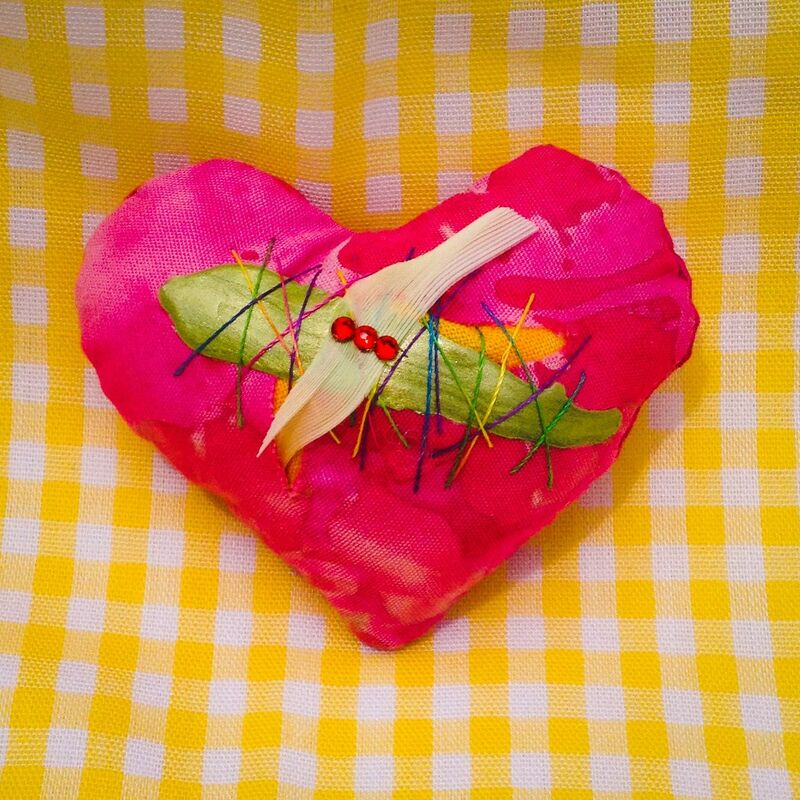 Mended Hearts are delicate yet strong. Mended Hearts are solid and bright. Mended Hearts have funky leather fringe and beads. 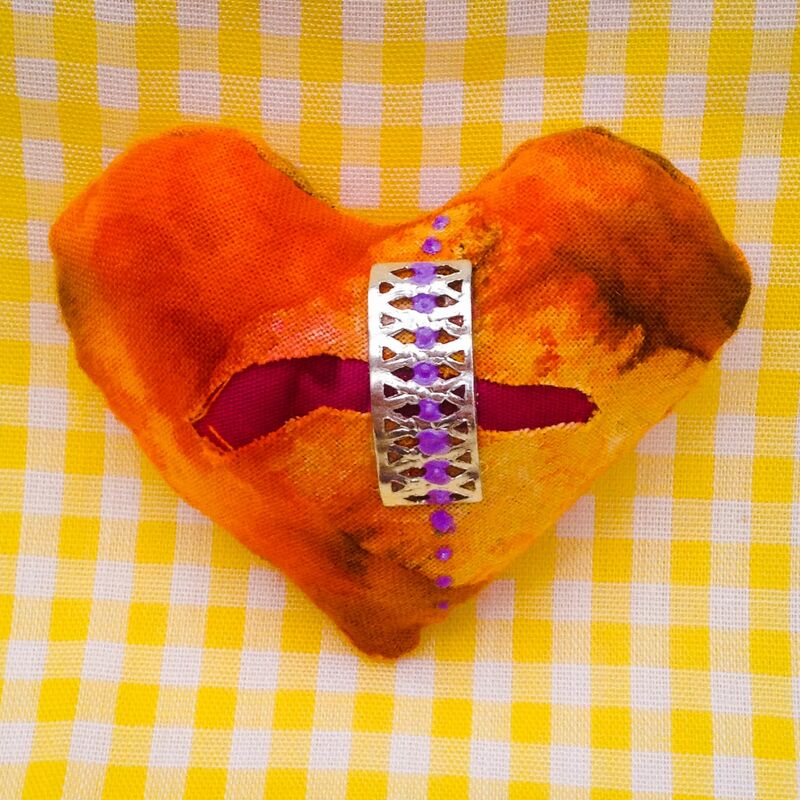 Mended Hearts are complex and complete. 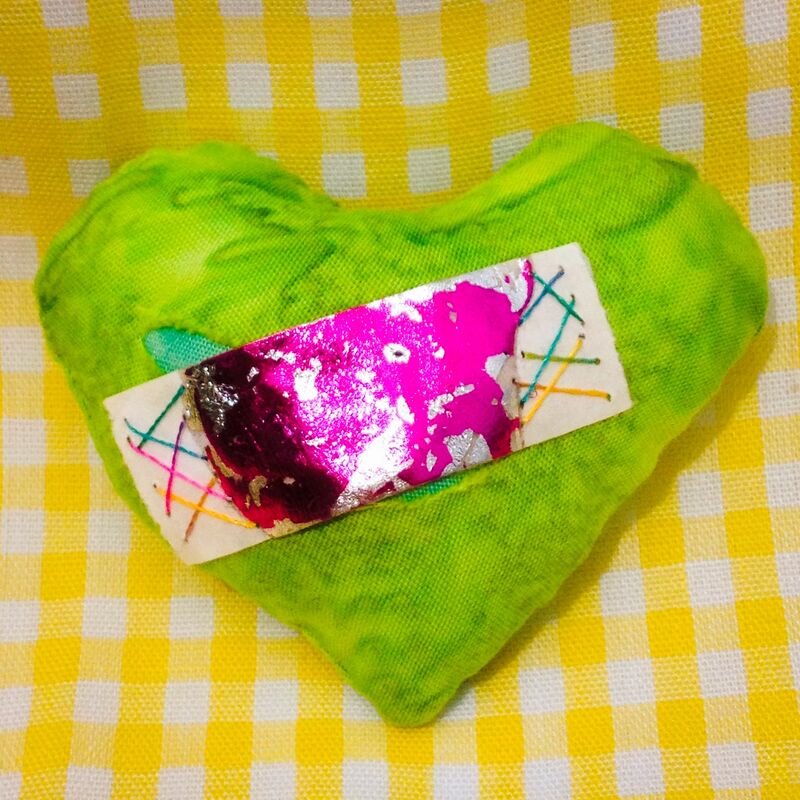 Mended Hearts are glittery and true. 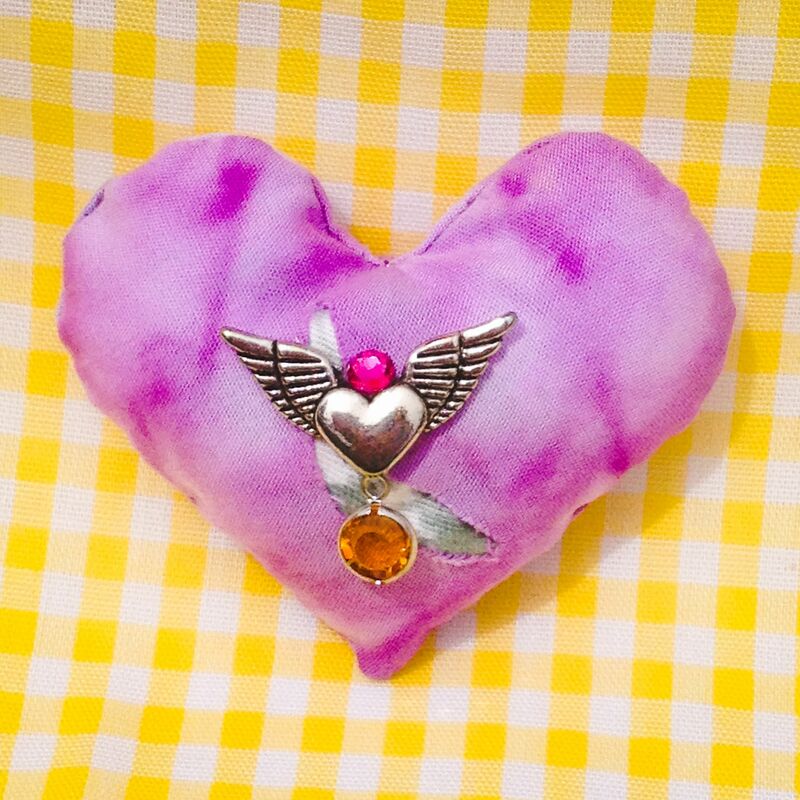 Mended Hearts have wings and things. Mended Hearts are waiting to connect with their homes. 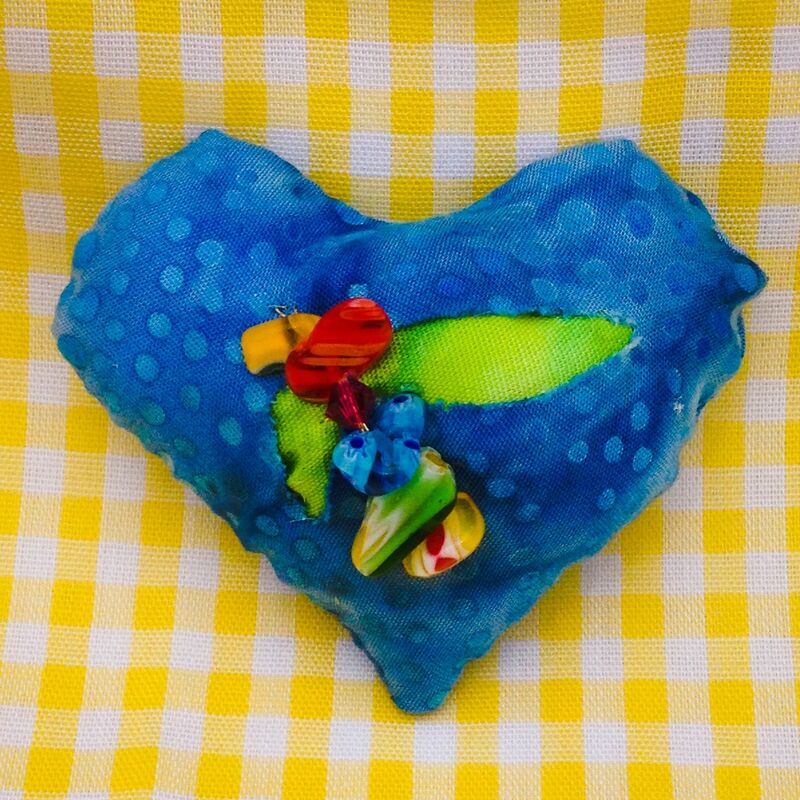 It is time for me to assist these precious little pillows of joy in finding their right homes. 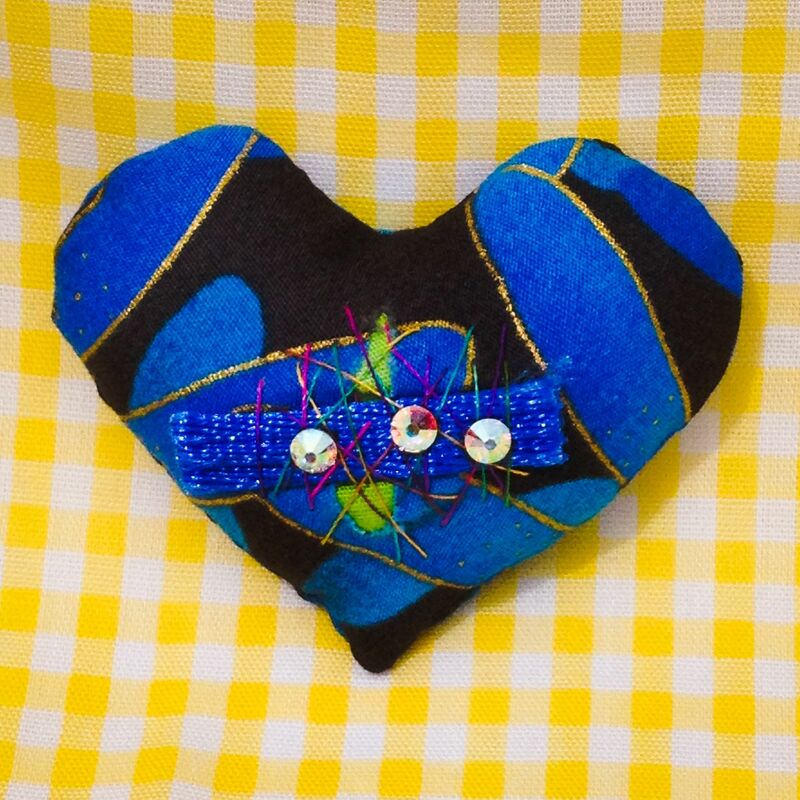 We are happy to connect you with a “family pack” of four Mended Heart magnets. 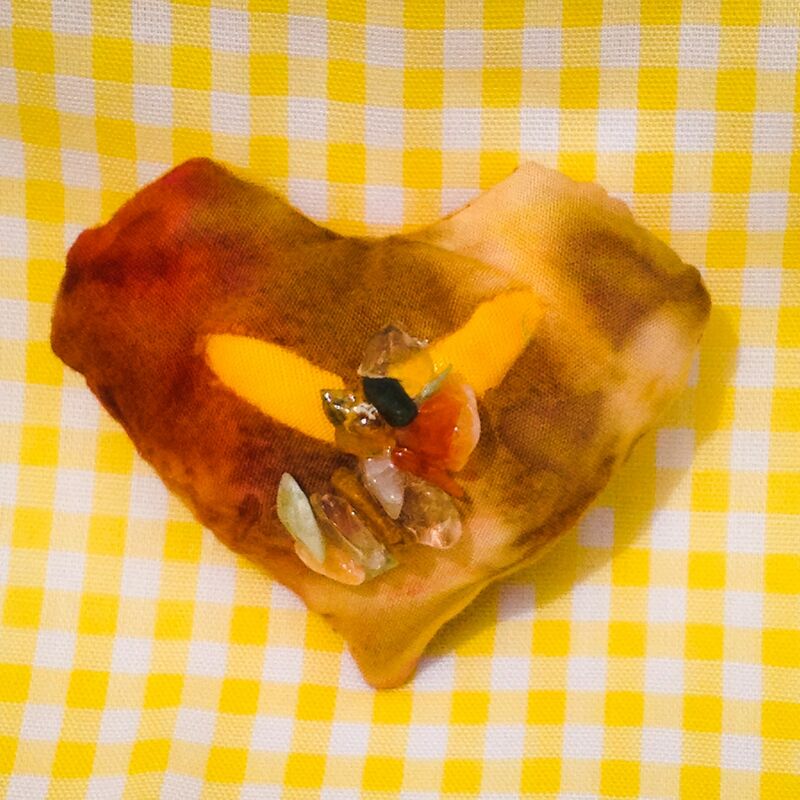 Please visit our etsy store to purchase and follow Mended Hearts on facebook.